This story is about dummying up. I call it The Bertie Wooster Tale. First, though, for this to make any sense at all, it is important to know that Bertie Wooster is P.G. Wodehouse’s amiable but thoroughly dimwitted protagonist in many splendid books. Kind of Paul Blart, Mall Cop, with more syllables and clever jokes. My point is that all of us, from time to time, do something truly stupid . . . or two truly stupid somethings, in my case. This is not a story I’m anxious to tell, but I feel I should for the following reasons. First, so you don’t go and do the same thing; second, because this shows that even the most experienced seaman can be guilty of a novice error; and third, because I am shamelessly willing to sacrifice my own dignity for a fairly good story. I’ll pick up the story where I left off last month. As you probably don’t remember, after a couple of false starts, my sailing buddy Jean and I, aided and abetted by Security Chief Bindi and Junior Seaman Sammy, succeeded in negotiating the overlapping shoals that protect Horn Harbor on the Great Wicomico River. We then changed our minds about anchoring there for the night and decided instead to take advantage of the beautiful day and press on south. This is where the new story begins. 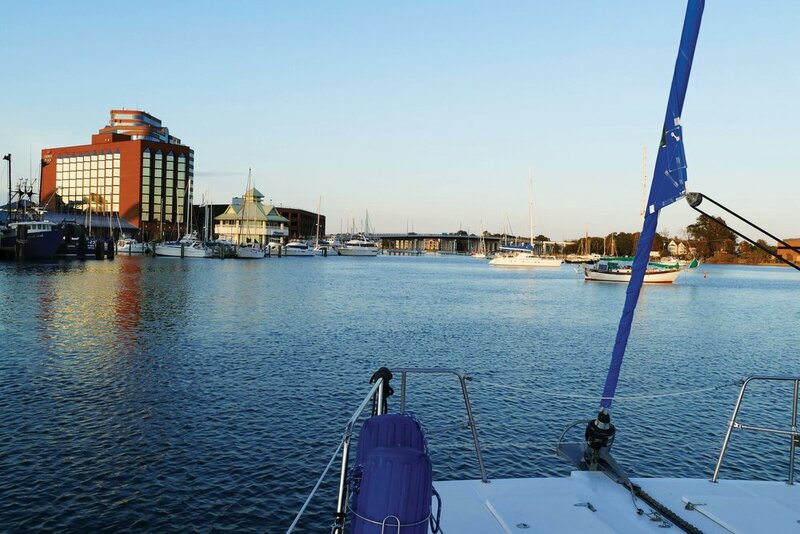 Once out on the Bay, we hoisted the sails and I called Downtown Hampton Public Piers for a reservation for that evening. I was really looking forward to showing Jean around Hampton, which is a thoroughly charming city. It’s too bad I never did. And indeed, by the time we had furled our sails and begun the short, three-quarter-mile trip up the Hampton River, it was nearly sunset. On our way up the entrance channel, Jean and I discussed the docking procedure ahead of us. The current was at flood, and we’d be motoring across it to get into the slip. The current would, in fact, be pushing us toward the bridge pilings. So Jean would lasso the downstream (up-current) cleat and make it fast to Moment of Zen’s mid-ship cleat. That would let us pivot our bow and then stern to the dock to tie off. Seemed like a good enough plan. As we passed red “16”, we admired the tower of Hampton University, which was aglow in the banana yellow light of late afternoon. On the other side of the river lay Bluewater Yachting Center and then Hampton Yacht Club. Soon the hexagonal building of the Hampton Maritime Center and Public Piers hove into view. I slowed to near idle to give our slip a good look, and then reversed (fatefully, as it turned out) to get a better approach angle, being careful not to get mixed up in the moored boats that were clustered around the fairway. After centering the helm, I began the approach using Zen’s twin screws. We were nearly to the slip, and I pushed the starboard engine forward and reversed the port to push the nose slightly into the current to avoid getting pushed toward the bridge. Suddenly I realized I had no port engine! Quickly the current sloughed the bow toward the bridge. “What the heck?” I said—that is not an exact quote. Immediately, I put the starboard engine into reverse, then out and spun the wheel to port then starboard to straighten us out. “Watch the bow,” I told Jean, unnecessarily as it turned out, for she was poised at the bow, boathook at the ready as if she were about to harpoon a whale. I slipped the starboard engine again into reverse, and searched for the balance point with the wheel. For the next few minutes, we seesawed back and forth between the Public Pier docks, the moored boats and the bridge, finally succeeding in getting Zen pointed generally back downriver and into the current. Whew, one problem solved. Meanwhile, I tried for the fourteenth time to restart the engine. Nothing. Now what? I didn’t fancy maneuvering through the mooring field in search of an empty mooring ball. And I certainly didn’t fancy taking another shot at that particular public pier’s slip. Meanwhile, my brain began to tick off the ways we could be delayed: finding a mechanic; getting a mechanic to come diagnose the problem; ordering parts; getting the parts put on. . . . In my mind, autumn was turning to winter. Snow was beginning to fall. Then somewhere in the depths of my cerebral cortex, a synapse snapped shut. Just before we had started our approach to the slip, I’d heard a boat radio Bluewater for docking assistance. Maybe they were still open. Maybe they even had something easy to get into, like a nice empty T-head. I picked up the mike and called Bluewater. Yes, they were open late. Yes, they did have a T-head we could use. Woo-hoo! Off we went in a slightly drunken beeline downstream until I figured out how to balance the helm and starboard screw. “We’ll just keep it simple and go straight in,” I told Jean, who was still patrolling the bow like Ishmael. Passing the schooner Unicorn, we edged toward the empty T-head and managed a perfectly acceptable landing. Jean looped the mid-cleat and then the bow, and I walked back to do the same at the stern. As I did so, I glanced automatically to check that the stern lines were in place. When I looked at the port stern line, I saw at once that while one end was attached to the cleat, as usual, the rest of it was over the side. It didn’t require the substantial brain of Bertie’s man Jeeves to figure out what had happened: The line had tumbled off the rail at some point during the day’s trip down from the Great Wicomico and had been trailing merrily and harmlessly behind the boat. Harmlessly, that is, until I reversed over it as I positioned Zen for her approach to the Public Piers slip. Then, faster than you can say, “What ho?” it had wrapped itself around the prop. So that was that. A trailing line and a wrapped shaft. I was a shoo-in for this year’s Bertie Wooster Gold Star for Dimwittedness. Now I’d like to tell you that the following morning I donned my flippers and mask and jumped overboard to free the line, but I didn’t. Brrr. I didn’t have to. When I reported to the dockmaster’s office to sign in that evening, I got the name of Don Jackson of Downunder Diving, who promptly returned my call and promised to arrive late the following morning. Which he did, with a helper of his own, whom he sent over the side to do the job. Approximately 30 seconds later, the helper emerged with the offending line, still intact. That line remains on the port stern to this day, a warning to me to do the job right. But what I haven’t told you yet is how I quickly went on to earn the Bertie Wooster Silver Cow Creamer Award for Idiocy. Here it is: After we had thanked the divers profusely and prepared to leave, I started the engines. The starboard kicked off as usual, but the port remained stubbornly mute. “Oh no,” I thought, “the line-wrapping has caused some damage. Again, inside my brain, the snow had begun to fall. I don’t want to prolong this sad story, so I’ll be brief. After tinkering around with the engine for a while myself, and then asking the advice of random people I found along the docks, I returned to the boat to begin calling around for a Volvo Penta mechanic. Just then, Downunder Diving’s Jackson and his helper happened to pass by in their dinghy on their way to another job. “Have a good trip,” Jackson called. “Thanks, but the engine won’t start,” I replied. “Try putting it in neutral,” he said. “What?” I exclaimed, “Of course it’s in neutral!” But it wasn’t in neutral. The night before, when I’d realized the engine wasn’t working, I’d left the throttle where it was and concentrated on steering with what I had. Later that evening I hadn’t put it back into neutral because it looked as if it already were. It wasn’t. I put it neutral, and the engine started as sweet as Valentine’s Day. “How . . .” I started. “Happens all the time,” he said and disappeared around the next fairway. Feeling about as bright as a string bean, I pulled Zen off the dock, and Jean, Bindi, Sammy and I headed south. We had no trouble whatsoever for the remaining 1,500 miles of our trip. I’ve put the Silver Cow Creamer away in the closet, and I devoutly hope it stays there. Over the years, I’ve used a number of methods to keep my dock lines ready for use when I’m cruising. And, despite my dummying up this time and making the loops too short, I have found this to be one of the best. It’s simple to do and simple to undo. When unwrapped from lifeline, the loops are ready to be divided and thrown. The key to success is to make sure the loops are long and even. This will prevent the whole thing from toppling over and coming undone, which is what happened to me. Before getting into the details, however, let me say that this is an inshore technique for use when you know you’ll be coming into a dock at the end of the day’s cruise. When I go offshore, I take the dock lines off and store them in the stern locker. When I am cruising on the Bay or the ICW, however, I find that keeping dock lines attached and ready to go, not only saves time and confusion, but provides an added level of safety. I keep one dock line at each cleat, fore, aft and mid-ships, because I won’t know until the last minute which side I’ll be using when docking. 1. Attach one end of the dock line to the cleat from outside the lifelines and bring the rest of the line over the top and back on deck. This way when you undo it you won’t have to pull it under the lifelines. 2. Toss the rest of the line out on deck to straighten it out a bit. Then start with the line where it comes over the lifelines and begin to make long even loops, holding the line in one hand (usually the left) and giving it a half-twist with the other while making clockwise loops. 3. When all the line is used up, drape half the coil over the lifeline and then reach through and pull that part through the rest of the coil. 4. Tighten this up so that the longest part of the coil is hanging inside the boat. That’s it.